Get the best of everything... The 'main floor' patio of this 1350 sq ft condo is only a few paces from the pool so you can keep an eye on the little ones from 'home' without having to give up your view of the lake. This spot was selected because it faces the perfect direction to maximize the warmth for your morning coffee. You can enjoy all the sun you want but still find shade when you want it during the heat of the day...you'll agree that it's perfect! This is a deluxe 3 bedroom with two TV's, two king size beds and a Queen. It's air-conditioned and was brand new in 2008. It's set up with Stainless steel appliances, a large Bar-B-Q and underground parking. Add a patio set, washer, dryer, dishwasher, microwave, full kitchen set up including blender, toaster, pots, pans and it's ready to move in and enjoy. Upgraded with granite, hardwood floors, bedding, and towels. You'll feel like your at the RITZ...with a beach! Whatever you want you've got it....The resort contains an outdoor pool, Jacuzzi, fitness center, boat moorage (available for rent) and private beach. We're Albertans that have long enjoyed the special environment the Okanogan offers. This location was a popular campground. After parking ourselves on the beach with family for years, when the owners decided to develop the property for condos...we had mixed emotions. Camping by the lake had created many memories. Now we're making new ones...and have to admit that having all the luxuries we enjoy here has eliminated the pain. We know everyone that visits will love this spot. This location and condo unit is a fantastic family vacation stay! The condo is self contained with everything you need for an enjoyable stay! This is a family friendly location with comfort and beauty around! The property is beautiful and the condo unit is top notch! Thank you to Larry and Michelle for being attentive to this property! It was our second time in the unit! We would not hesitate to rent it again when returning to the region! The golf courses are near and tons of vineyards around the area! I have been staying at Larry and Michelle's home at Barona Beach since the end of April and my stay here is coming to a close at the end of May 2015. I have absolutely LOVED staying here! 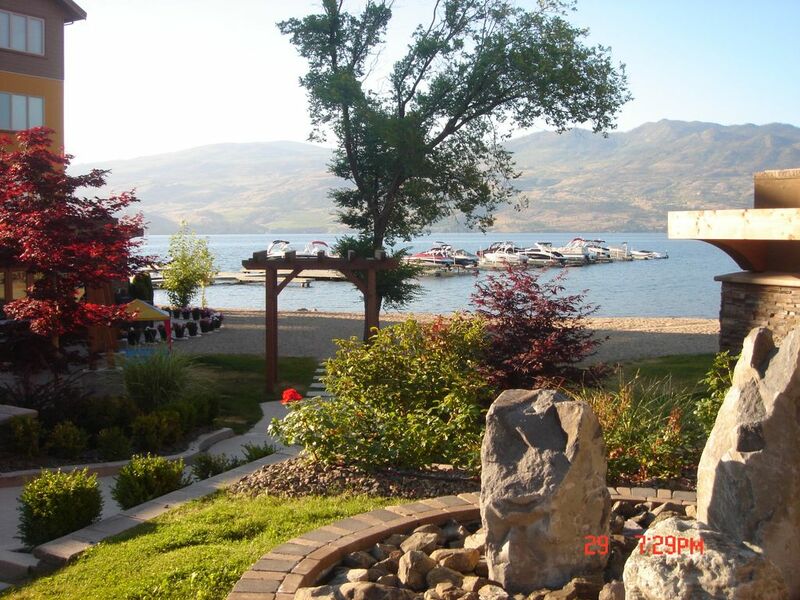 I am working in West Kelowna and every time I come home I feel like I am coming home to a resort. This place has it ALL! Pool, hot tub, fitness facilities, families...the grounds are kept impeccable and the suite is 10 out 10! Beautifully decorated and the beds are extremely comfortable with luxury linens. The home is fully equipped with everything you could possibly need so all you need to bring is your clothing, toiletries, and food and just enjoy! The location on this property is also ideal. The ground level offers a roomy patio and exceptional view. I would HIGHLY recommend staying here. Not only are you in for a treat of luxury resort living - Larry and Michelle are the most accommodating and gracious hosts. I can't wait to stay here again! Just got back from Portugal and saw this today...wow. Thanks so much for your generous comments. They're much appreciated. This is a beautiful property to stay at! Staying on ground level made it accessible to get to the pool and beach! The condo is lovely! Clean and all the amenities you would need for your stay! Lots of room for 6 adults! We would do this again! We had many relatives staying on the Barona property and it made for a great family visit in a beautiful resort! We're very pleased our guests are happy and hope to see them again and again....and again! This was a fantastic place to stay with amenities for all ages. For the young kids, being on the ground floor meant the living space (and running, biking, scootering space) extended from the living room out into the giant courtyard. The heated pool and the beach occupied the kids for hours. Lovely meals outside on the patio, upscale living arrangements made for luxurious sleeps. Everything we needed in the kitchen including a blender and knives that work, all the BBQ gear you need. And pool toys in the back closet - nice touch! Owners very responsive to any questions we had. Will definitely come back if life brings us to Kelowna again, as we didn't get much of a chance to explore the wineries which were practically on the doorstep. Probably need a car, though I did see bus stops nearby. We stayed at this condo for three nights in September to do some wine touring in the Kelowna, Naramata Bench and Oliver wine districts. The condo was such a nice place! Well appointed, very clean and having a hot tub and the end of the day was the pièce de résistance!! Hope to go back next fall! Thanks for your comments. We're pleased you enjoyed your stay and look forward to seeing you again. We're so happy people think our place is special. It's location just off the pool, without compromising privacy, provides plenty of advantages...we're lucky, lucky! For longer periods we are prepared to offer discounts. Please contact us for a quote. Sorry no pets are allowed to protect other visitors that may have allergies. Only families and responsible adults please.